Get your girls ready for first aid with age-appropriate activities to teach them the basics. Fun and learning in our kit, Intermediate First Aid Badge in a Bag® from MakingFriends®.com, for six girls to complete the five requirements for the Junior First Aid badge. 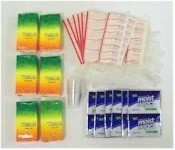 Order our first aid supplies or gather your own. Intermediate First Aid Badge in a Bag® from MakingFriends®.com will make it fun and easy for your six girls to complete the five requirements for the Junior First Aid Ready badge. 18 reviews for "Intermediate First Aid Badge in a Bag®"
Makes my life as a Girl Scout Leader easier. 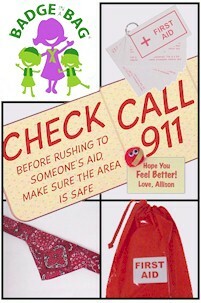 I gave a talk to the girl scouts in my daughters troop about first aid and ordered these bags for them. The girls loved them!! I did feel I had to add a few more items ,like gauze and bandaids, myself but overall it was a good purchase. It was easy for the girls to do. The badge-in-a-bag use to contain more items. We had to suppliment it to make it scout ready. The girls had a fun. Our Senior Troop hosted a Badge Day and this was one of our workshops. We had the local volunteer EMS to come out for a presentation and used this kit to complete the requirements. The girls really got a lot out of these kits and it make it easy for the Teen scout hosting the workshop to marry the activities up with the Badge requirements. Everyone was very happy with the kits, both those hosting the sessions and the girls who attended. i purchase this for my girl scouts. i think the kit is excellent and towards thier junior first aid badge. 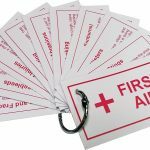 For that price the supplies for the first aid bag should be included. My girls did this badge also completely on their own!!!!!! It was a breeze for me and they were very proud. We meet after school and they are still thrilled each week when they see their giant bandaid posters hanging up in the halls. Just order the Flower badge. Can’t wait to see that one. The kit was a good value and the girls had a nice kit to take home. Just what I was looking for. The girls loved the activity. 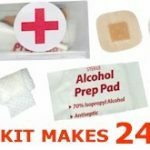 Just added our own band aids, alcohol pads. I thought the first aid badge in a bag was great for my troop to do in a meeting to fulfill the majority of requirements for the badge. I did need to do a bit of research to supplement it and we purchased some first aid items (band-aids, etc) from the store for our kids, but overall it was a great badge in a bag. And overall, the badge in a bags are such a great item to have on-hand to pull from when pulling a meeting together in a pinch. The girls really loved this one, and getting the bag to put everything in was a real plus. They use this one everytime we go somewhere or even at meetings. This is a great kit. 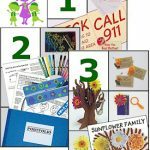 The Junior First Aid badge is supposed to be a step above the Brownie one, but these activities are almost identical and neither teaches barely anything about first aid. I was very unhappy with the product, the plastic bags themselves are cheap, and you gave me a sticker to put on them?? I had to punch holes in all the cards myself to connect them to the clip? I still had to purchase all the items to put in the bag. And the most disappointing….one of my scouts pointed out typos on the emergency info cards!!!!! I will prob not use this site again, I would rather pay more for a quality product. I bought this bag as a sample to show the leaders in our Service Unit that it was not expensive and several parts to completing the badge work are included. My troop had a great time learning and putting things together. They were very proud and excited to earn this patch from making this kit for themselves and other troops. I bought one of these to try out with my daughter. She had a blast putting “her” kit together. She loved putting together the first aid booklet and she spent rainy afternoons reading every word in it. It’s a great buy for the price. And the cap on it all for my daughter was that she got a new patch to put on the back of her Brownie vest. I highly recommend this kit for Girl Scout troop or Cub Scout den.